In a New Jersey school district, a five-day global challenge turns students into problem solvers and transforms teaching and learning. It's a warm day in June during the second-to-last week of school. But rather than focusing on yearbooks, class trips, and summer plans, students in the West Windsor-Plainsboro Regional School District in New Jersey are tackling some of the world's most dire and complex problems. In one corner of a hallway, a group of teens designs a website for their client, Pro Mujer, a Latin American women's organization dedicated to breaking the cycle of poverty. Across the hall, two students share headphones as they listen to a podcast on microfinance to determine which entrepreneur should receive a loan based on the value the proposed project would add to the local community. In the media center, another team engages in a heated discussion about the geographic constraints of Nepal on the country's proposed water-filtration prototype. Even though the school year is coming to an end, the students are highly focused, genuinely engaged, and impressively productive—a result that Mark, as curriculum supervisor, and other district staff and administrators were hoping for when they designed the aptly named Global Challenge project in 2009. The weeklong interdisciplinary project engages the district's approximately 800 8th grade students in applying higher-order thinking skills to address eight world challenges, from global hunger to gender equality. The project provides students with an opportunity to select from a set of problem-solving tasks in accordance with their personal interests and talents. Students are divided into teams of five within their chosen challenge area. The teams then research their challenge, define the root problem, consider possible options, and propose a well-reasoned solution to address the need. Along the way, this newly formed team works together to develop an effective presentation to convince an authentic audience of local community leaders, nonprofit managers, and international development experts to "fund" their project. The project was inspired by and grew out of the district's work with the Understanding by Design (UbD) planning framework developed by Jay and the late Grant Wiggins. The framework encourages educators to "begin with the end in mind" (2005) when designing curriculum and assessments. Accordingly, West Windsor-Plainsboro's leaders focused on the district's mission, which declared a commitment to developing six 21st-century skills as student outcomes—flexible and self-directed learner, collaborative team member, practical and innovative problem solver, effective communicator, information literate researcher, and globally aware and responsible citizen. An accompanying strategic plan charted the course toward accomplishing these goals. In order to ensure clarity, the district specified a set of observable, measurable indicators for each of these cross-disciplinary skills. For example, indicators of innovative and practical problem solving include observing situations, brainstorming solution strategies, making connections between information and arguments, and transferring learning to new situations. These cross-disciplinary indicators (bit.ly/WWP_indicators) specify desired outcomes for learners, provide guiderails for projects, and influence district curriculum and assessments. Identifying outcomes and their indicators is the first stage in the "backward design" planning process (Wiggins and McTighe, 2011). The next stage asks educators to "think like assessors" and specify the evidence that will demonstrate that students are making progress toward targeted goals. Learners truly demonstrate their understanding when they are able to apply or transfer their learning to new situations and problems. Too many problem-solving assessments merely require the application of a memorized formula or procedure. True problem solving demands more. The district's administration and staff wanted to have more than just a mission as a platitude that is written on a hallway poster or printed on stationery letterhead. They wanted to apply the ideas of UbD to create a signature learning experience that enabled the district to teach and assess what it values. They wanted to present students with an authentic challenge that would require them to apply the district's identified 21st-century skills to confront a real-world problem and share their learning with an outside audience. Once students select their challenge problem, the project week begins. Students assemble in the auditorium to receive further information on global development and gather into their teams. During the first four days of the project, students have team time during social studies, mathematics, science, and language arts classes to brainstorm problem-solving strategies and solutions. Each teacher involved in the project oversees five teams during the week, but the students are completely self-directed, fully in charge of their own time, and determine how they define and analyze the problem. The teachers observe and record the quality of student collaboration using a checklist that tracks whether the student is a responsible team member (prepared every day? ), a cooperative team member (respected others' ideas and opinions? ), a leader (helped the group set goals and stay focused? ), and a self-directed member (persevered and helped the team get "unstuck" when there were difficulties?). Students then select the media, such as a video or slide presentation, with which to make their proposal to an authentic audience of judges composed of parents, teachers, business leaders, and high school students. These panelists receive comprehensive training the morning of the event on how to judge the presentations, and district administrators show videos of past student presentations as exemplars. On the last day, à la "Shark Tank for Social Good," each team has 10 minutes to convince the judges to fund their development plan (or their social media campaign, innovative design, or funding proposal). Student presentations take place in each middle school across multiple classrooms, with five panelists per room scoring six to seven groups of students. To judge the presentations, panelists use district-developed rubrics that are based on the same criteria that experts employ in seeking funding for their real-world projects: Is the problem clearly defined? Is the reasoning sound and within the parameters and context of the problem? Are the solutions offered feasible and likely to address the problem? The judges must reach consensus on these "impact" criteria. Students are also evaluated on their ability to effectively communicate and respond to questions from the panelists. After their presentation, they receive feedback on their performance and find out if their project was "funded" or not. As a reward—and to encourage healthy competition—the top-scoring groups, about one-third of the total, are invited to participate in Skype calls on the following day with international experts. Each group has approximately 30 minutes to speak with these experts about their project, and the videoconference provides an additional challenge, as students must adjust the purpose of their presentation from persuading the panel of judges to engaging in dialogue with an expert. During the 2016–2017 school year, more than 250 students participated in 60 Skype sessions (across 10 time zones and all in the span of one school day) with experts such as the United Nations Development Programme's country director for Sudan, a professor from Toyo Eiwa University in Japan, and the communications manager from the Malala Fund. The Global Challenge design team wanted to ensure that this project would impact more than the students who directly took part in this week-long experience. It was intentionally designed to elicit meaningful data that could inform curricular choices and student learning across grade levels and content areas. When the project began in 2009, teachers were very hands-on, providing mini-lessons and models of what good problem solving looked like and what made for effective presentations. However, teachers began to recognize that they were over-scaffolding and directing the students, and therefore the results weren't always indicative of actual student work. Shifting to being "hands-off" was uncomfortable for many teachers initially. It was not the norm to allow students to self-direct without offering significant guidance. What if they couldn't do it? What if they failed? What if it was too hard? However, as teachers released control, they saw the payoff—greater student engagement, initiative taking, and autonomy—outcomes that we want to become more common throughout the school year. 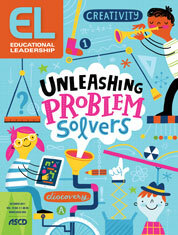 As a result, students emerged as stronger problem solvers, communicators, and collaborators. As one of the students commented, "I think one of the biggest strengths I'll be taking with me as a learner is the ability to work on my own without the step-by-step guidance given by a teacher. The Global Challenge was definitely a wake-up call to become a more intellectually independent student." ▪ Students can be motivated to learn without grades. They will work hard if the learning is challenging, interesting, and meaningful—irrespective of grading. Students know from the outset that their job is to convince judges to fund or hire them; this shifts the thinking from what could be a traditional oral presentation to a real-world persuasive argument designed to sway the opinions of respected adults. ▪ Student freedom should be coupled with clearly identified outcomes and expectations. When surveyed after the challenge, students said they enjoyed the independence of the project, but also liked having outlined expectations and criteria for an authentic purpose. ▪ Transfer tasks can provide evidence of mission achievement. The results of the Global Challenge provide educators with useful data to measure how well the students are meeting the district's mission, and this in turn informs curricular, instructional, and assessment revisions. An important feature of the Global Challenge is that it requires students to transfer their learning to a "messy" problem on their own. Research tells us that learners truly demonstrate understanding when they can apply or transfer what they know or are able to do to a new situation (Wiggins & McTighe, 2011). It is through authentic tasks that we see evidence of true problem solving. ▪ Rubrics should focus on impact, not just compliance. When the task or project is authentic, use impact criteria, such as how effective student performance was in achieving the desired result—independent of effort, attitude, methods used. If the student presentation was not entertaining, informative, or persuasive, then even if other skills were evident, the work did not achieve the desired result (Wiggins & McTighe, 2011). Too often rubrics measure only what is easily assessed and not what truly matters or is valued. communicate to diverse audiences using varied media. West Windsor-Plainsboro has been formally collecting student performance data on the Global Challenge for the past six years.2 The data indicate that there has been a steady increase over time in the quality of student problem solving, collaboration, and communication skills. Another trend has been the increased convergence between how the students self-assess their skill proficiency as compared to their teacher's perceptions, demonstrating a greater shared understanding of these skill performance indicators and expectations. Moreover, teacher surveys between 2013 and 2017 confirm that students have become much more capable of complex problem solving. Rather than only measuring individual and team performances, the results from the Global Challenge also serve as an annual "physical exam" for checking the relative "health" of the district's success in meeting its mission. The district relies on this data to inform program offerings, curriculum writing, and assessment development. For example, it has worked to develop common language for K–12 mission-related skills, embedded complex problem-solving opportunities into the K–12 curriculum, allowed greater access to technology (including a 1:1 device program starting in 5th grade and extending into high school), and designed common assessments that measure both content knowledge and 21st-century skills. In a rapidly changing, information-rich world, it makes sense for a contemporary education to prepare students to transfer their learning to confront unpredictable challenges and opportunities. However, as Wiggins reminds us, "Transfer doesn't just happen as a result of a typical regimen of teaching and testing, no matter how rigorous the course of study. Transfer happens only when we aggressively teach and test for understandings that are applied in new situations" (Wiggins, 2010). Designing and implementing transfer tasks and assessing student performance on them is the only way to ensure that students are prepared to apply their knowledge to the rigors and challenges that await them in higher education, in the workforce, and in their lives. The Global Challenge engages students in real-world problem solving to measure the district's efficacy in developing these skills—yielding real solutions, by design. 1 View the task sheets, resources, and rubrics for each project option. 2 The district's data charts may be seen here. Mark Wise is the supervisor for curriculum and instruction at West Windsor-Plainsboro Regional School District in New Jersey. Follow him on Twitter. Jay McTighe is an education writer and consultant who co-authored the Understanding by Design series with Grant Wiggins. Follow him on Twitter or visit his website at jaymctighe.com.